The view looks north along Summit St. where it meets Waterloo at the point in front of the quonset shaped building. Just beyond the intersection Waterloo crosses Fulton St. A triangular area is fenced where the two streets meet. The street entering Summit on the right is probably Island, now called Weston. A boardwalk runs the length of Summit St. on the edge of the unpaved road. This photograph shows the continuation of Summit St. north of the Summit Street House and the Grocery Store, whose sign can be seen at the far right. They can be seen in the photograph titled "Summit Street House." 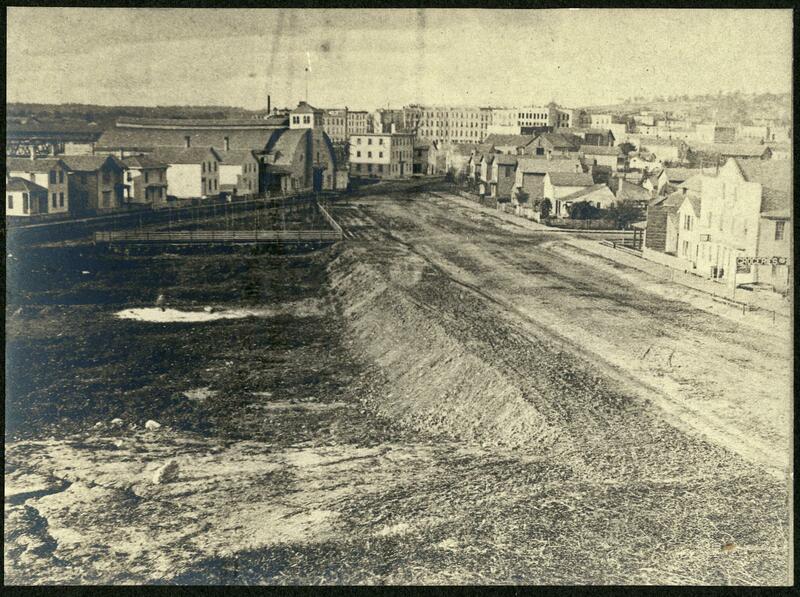 Waterloo, previously called Water St., became Market St. in 1899. Summit Street was renamed Ellsworth St. in 1885, and became part of Grandville Ave. (from Fulton to Bartlett) in 1928. From a collection of photographs depicting Grand Rapids around 1872, previously owned by Charles E. Belknap, author of "The Yesterdays of Grand Rapids" and longtime resident of the city.